What Bites Are These From? I started getting bites 3 weeks ago. They are usually in two-three patterns about 1 inch apart and gets worse as the days go by. They turn into red, raised lumps that are inflamed and itch. In several occasions they have a white or red dot in the middle after the swelling goes down. The first couple days, I got some on my back, 1 on my thigh, shoulders and a couple especially in my right arm. I check my bed everyday and wake up in the middle of the night with a flashlight but NOTHING. I’ve researched about bed bugs but can’t find any signs anywhere. I bought my new mattress a year ago and never had any problems. After several days of the bites, the area of the bite turns into a dark spot I washed my bed covers and for 2 days, I did not get any new bites, but it started again after 3 days. Now they are only in my right arm. I don’t know what it could be but I provided pictures. I need answers. Someone please help. Bed bug bites do have a light or white center that marks where the bed bug bite occurred. Actual symptoms vary among people since it is an allergic reaction. 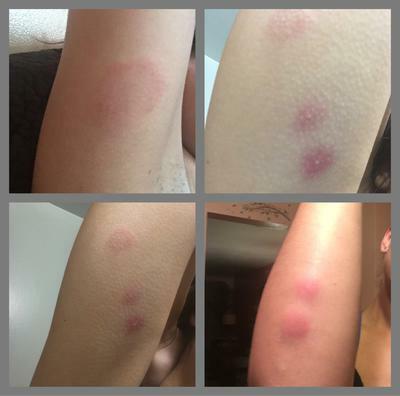 Since bed bug bites can look like bites from other insects such as mosquito bites it is suggested that to confirm the diagnosis you find actual signs of bed bugs. One way to do this is to bring an exterminator from a reputable network such as Home Advisor. If you hire an exterminator with a bed bug sniffing dog that could confirm the presence of the insects. One way to avoid the bed bug bites at night is to wear tight fitting clothing on exposed skin areas such as socks over the bottoms of pajamas. Bed bugs will not bite through clothing. If you are still getting skin reactions then it would be time to look for another cause. A dermatologist might also be helpful in making a determination. Our guide to insect bites and other causes might also be helpful.